My mom makes amazing Russian food, most of my "Russian" recipes come from her. She was and still is a supermom. She managed to work, run a household, cook dinner every day, and raise 7 kids. Every summer she would can her own pickles and tomatoes. I actually dreaded those days as a child. It meant all hands on deck. 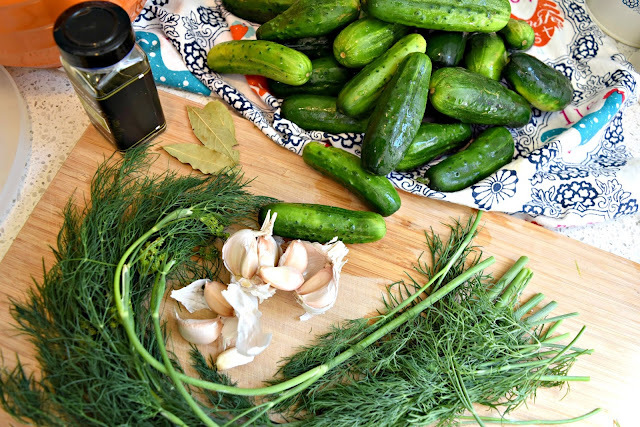 Jars needed to be washed, garlic needed to be peeled, bags of pickles needed to be scrubbed, dill needed to be chopped. But now as a mom I look back I realize those were amazing bonding moments, and I really miss those days. I miss sitting around the dining table with my sisters talking and helping out. Especially since they all live across the country from me. I love the idea of canning, but this is not something I want to do. However, making refrigerator pickles in ridiculously easy. In Russian they are called: Mалосольные Oгурцы. 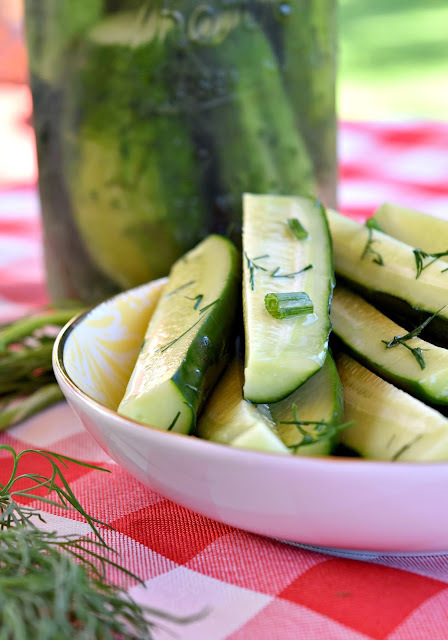 (Low Sodium Dill Pickles) I grew up eating these pickles my whole childhood. My mom would make them often during the summer for the weekend. They last about a week in your fridge, but we always eat ours within 2 or 3 days. 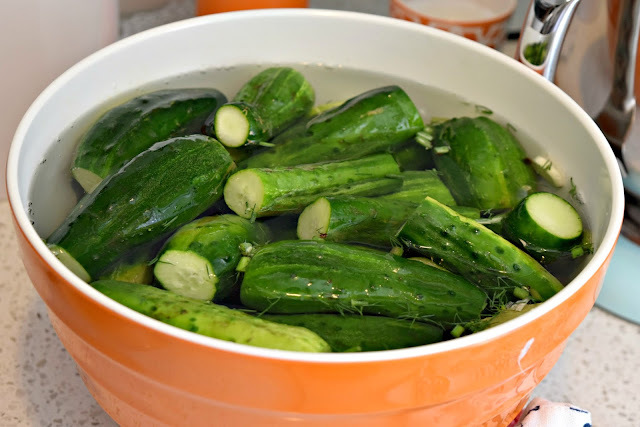 Wash and cut both ends of the cucumbers. 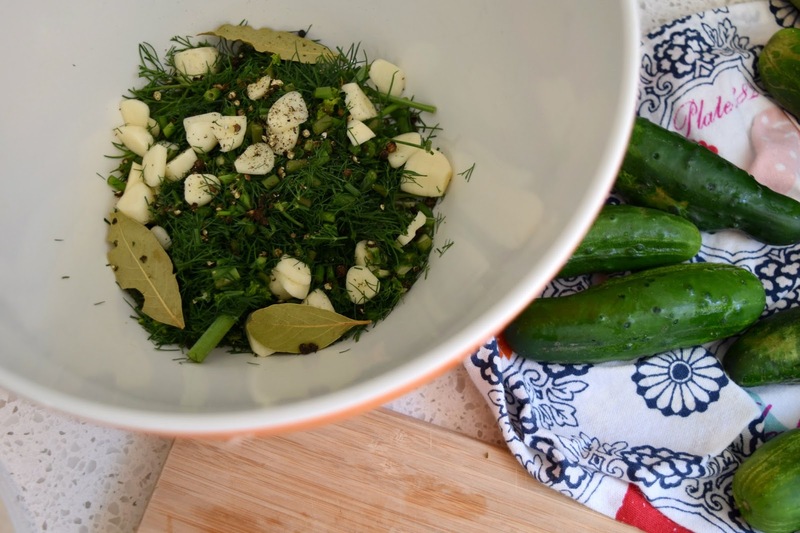 Place chopped dill, garlic, bay leaves, pepper corns in a large jar or bowl with a lid, then put in your cucumbers. In a medium size bowl or a 4 cup measuring cup, add 4 cups of cold water and 2 TB of picking salt. Mix until completely dissolved. Pour over the cucumbers. 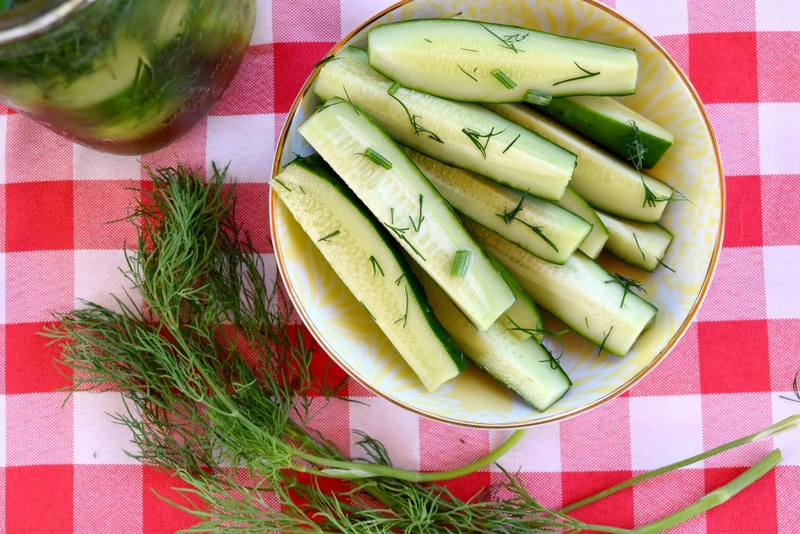 Repeat until all of your cucumbers are completely covered with water. I had to repeat 2 times. Place into the fridge for 24 hours, and then enjoy. These are amazing and can get addictive. I love to slice some up to snack on during the hot summer days.